It looks likely that we made the newest top to the straight up/straight down moves that have defined the range since the 1101 low, because yesterday's move down appears impulsive -- which means it should continue lower after a bounce or two. This continues to hold true for the market: as yet, there is still no way to count the move down as complete. 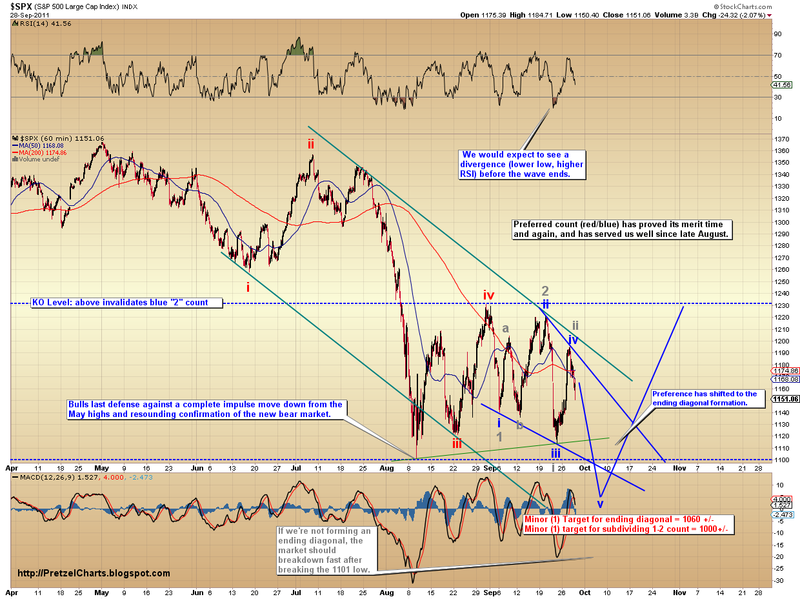 The current waves on the smallest timeframes indicate the market is now trending down. Futures are basically flat right now, but I am expecting another brief pop tomorrow, likely in the morning, and then further downside (see 1-minute chart). Since there is no way to count the waveform as completed, further downside from this level is virtually guaranteed -- whether it comes tomorrow or Friday/Monday. 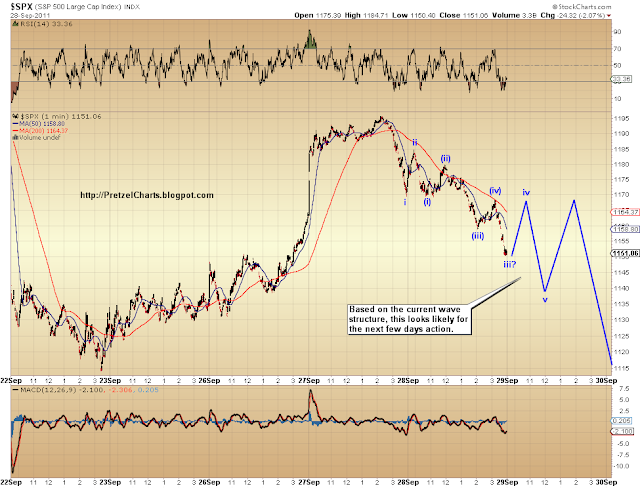 We are still favoring the ending diagonal here for wave v, as discussed yesterday. I have added a 1-minute chart to illustrate what is currently the most reasonable interpretation, and expectation, for the next few days. Please note that the blue lines I have drawn in to represent the future moves are not intended to be time accurate; I am simply working to illustrate within the available chart space. These moves could all happen tomorrow, or (more likely) stretch out over a few days. Oh, we have also made it easier for readers to post comments. Feel free to comment or ask questions at any time! Trade safe! Pretz, does the move on the first chart end at 1115 and then start up again? Or does it go lower than that but you just ran out of chart space? Thanks for your great analysis work here. Hey Pretzel - nice call on action -- looks like you almost nailed it today with the 1175.87 high and the 1139.93 low. Does your count change at all given that the high today tooks us through your (iv)count from yesterday? If not, what's your best guess on tomorrow's high before we reverse course? Also - if we close below 1206 on SPX -- we will have our first monthly close below the 20 month moving average ... how much weight does that hold in your analysis? Hi guys, thanks for the questions and the positive feedback. To answer the one quick question Bill asked: yes, the overlap has to change the count; one possibility was that this wave down was a leading diagonal. I don't have time at the moment to draw up the charts and get into more detail, but I will address both of your questions further in tonight's update. For me, MA's are nothing but confirming indicators; and ocassionally they are likely targets for price movement. Closing under the 20 month would, to me, simply be another confirming indicator that the bear is just getting warmed up. 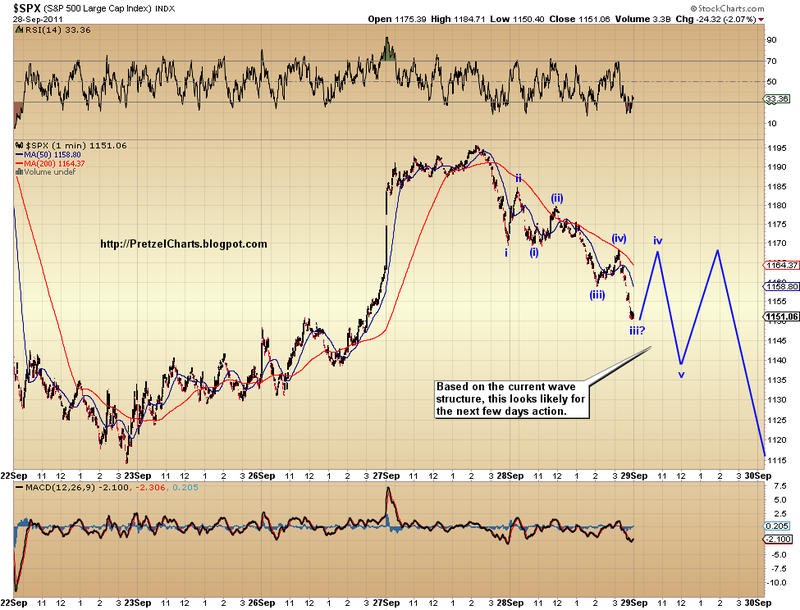 Pretzel, the first count goes down to 1115 as its target low before a rally? 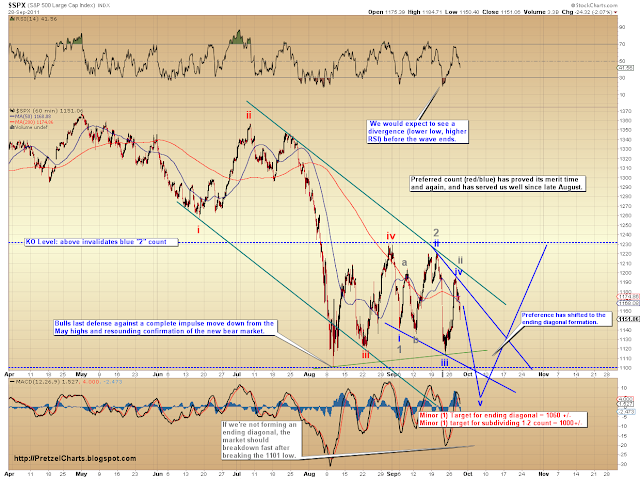 And the alternate count down to 1060 or perhaps to 1000 before a rally? I guess you will be updating all these charts and targets over the weekend though and they may be different after today's action. Thanks.